A new University of Toronto study has found mothers who show increased interest in infants while pregnant report stronger bonds with their babies after birth. 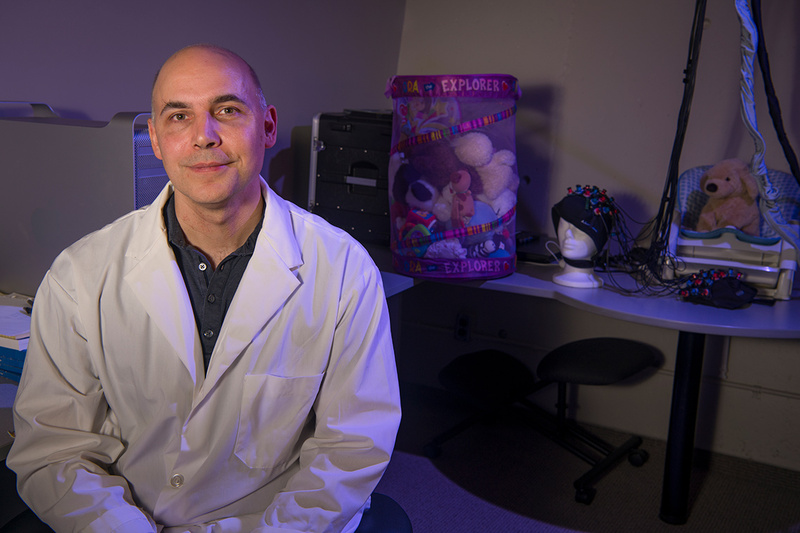 The study by David Haley, an associate professor of psychology at U of T Scarborough, is among the first to look at whether functional changes in mothers’ brains during and after pregnancy are related to mother-infant bonding, which is considered important for childhood development. By contrast, past research – which also suggests the transition to motherhood triggers structural changes in the brain – has tended to focus on the postpartum period. “Our findings support the idea that, over the course of pregnancy and early motherhood, the responses in the brain to infant facial cues actually change,” says Haley, who is also director of the Parent-Infant Research Lab. The study involved 39 pregnant women, ages 22 to 39, from various ethnic and educational backgrounds. Each of the women visited the lab twice – once in their third trimester and again three to five months after giving birth. During the visits, the women took part in a face-processing task where they were shown images of sad and happy infant and adult faces while their brain activity was measured using electroencephalography. When responding to infant facial cues, the researchers observed increases in electrical activity in the part of the brain responsible for attention processes that occur within a fraction of a second. “This goes to show that mothers are increasing their cortical receptivity, but what’s fascinating is that this increase seems to predict behavioural receptivity to their infants,” Haley says. One surprising finding from the study is that a significant change in receptivity to infant facial cues was seen only among some mothers between pregnancy and the postnatal period. “That was unexpected,” says Joanna Dudek, who earned her PhD in Haley’s lab and co-authored the research. The mothers in the study were all shown unfamiliar infant faces, so Dudek says it’s unclear whether mothers who did not show a change in receptivity would do so if they were shown their own infants' faces after giving birth. Haley says understanding how emotional and cognitive networks in the brain contribute to mother-infant bonding is an important area of study. “There’s been a lot of research on the importance of forming close mother-infant bonds, but little is known about how this bond may start developing in the first place,” he says. Why some mothers experience a change in receptivity and others don’t remains an open question. Haley says the mental and physiological health of the mother could play a role, pointing to recent research that shows stress can dampen and inhibit the neural responses to infant facial cues. Unpacking why this happens is an important next step for the research, along with measuring whether there’s a change in mothers’ neural receptivity to infant facial cues beginning earlier in pregnancy. There’s also good news for mothers who don’t show an increase in receptivity to infant facial cues. Past research has shown training can have an impact. “There are studies showing that mothers can do it with infant stimuli, so it’s possible that mothers could learn to increase their attention bias towards their infant,” Haley says. He adds that a topic for future research is whether attention increases gained through training can predict maternal bonding. The study, which received funding from the Natural Sciences and Engineering Research Council of Canada, is published in the journal, Child Development.